Rehearsals are stressful and run long. Prepared team members resent those who aren’t showing up. Mistakes and other musical issues can distract people from worship. Team members aren’t confident or expressive. Sunday morning soundcheck are stressful because you’re still working out musical issues. We’ve got a two-part approach to help you build a team that values preparation. Step 1: Build a Preparation Process. To create a fantastic culture of preparation in your worship ministry, you need to build processes, structures, and expectations that support and encourage the RIGHT behavior. Team members need to understand why preparation matter, how to practice, what to practice, and even how much. While some team members understand all this, too many don't. You can't assume your team knows how to practice. Here are the two resources to help you build a culture of preparation. In this workshop, you’re going to learn a step-by-step process to change the culture of preparation in your worship team. The nine-step process that will take your team from semi-committed to ALL IN. Your critical responsibilities on YOU as a leader to ensure your team is prepared. Tips and techniques to motivate and encourage your team to practice before rehearsal. How to hold your team members accountable to a higher standard of preparation. 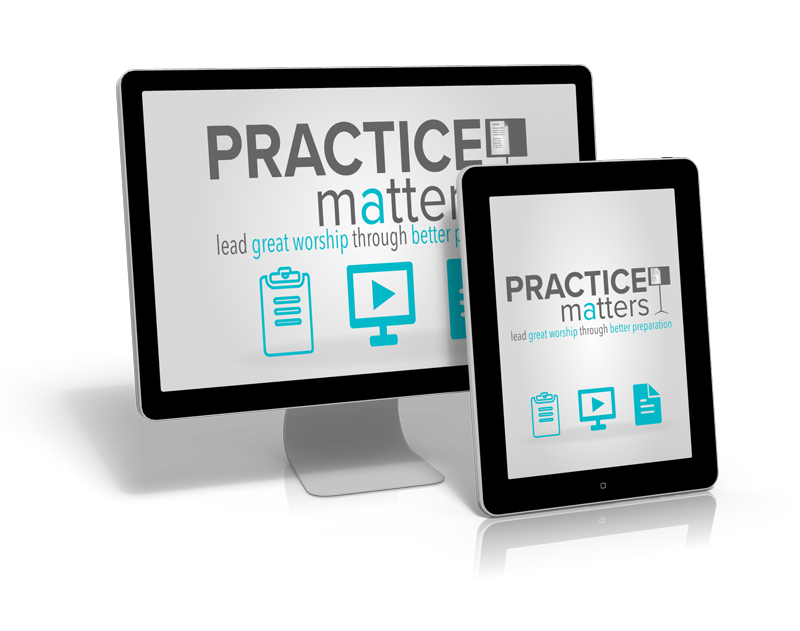 Practice Matters is a training course designed to help you lead your worship team members towards great preparation habits. Teach your team the value of preparation from a Biblical perspective. Reduce the stress and frustration of people coming unprepared to rehearsals. Help make the most of your rehearsal time. Teach your team practical techniques that will improve their ability to prepare. Grow the musicianship & commitment level of your team members. Encourage and teach your team to memorize their music. Practice Matters will teach your team why preparation matter, how to practice, what to practice, and even how much to practice. And each module is short enough that you can show during rehearsal, lead a meaningful discussion, and still have plenty of time left to rehearse for Sunday. Discover more about how practice matters can help you change your team's culture of preparation. Not Ready For the Full Course? The Get Practicing Toolkit will help you clearly communicate your preparation standards to your team members. They will know what you expect when they show up to rehearsal. And they’ll how much they need to practice to meet that expectation. And best of all, they'll know when a song is ready for Sunday.